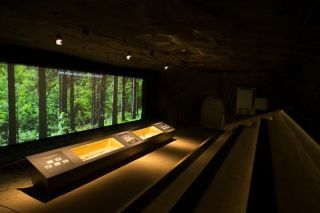 Scenomedia’s latest installation at Austria’s famous Salzwelten salt mine experience includes the Bronze Age Cinema located 400 metres below the Earth’s surface in natural Dachstein limestone bedrock of the Hallstatt Mountain Salt Mines in Austria. Scenomedia installed AV Stumpfl show control, multimedia and screens as core technology throughout. One view of the display at the Salzwelten salt mine experience. The Bronze Age Cinema was created in a 1,000-cubic-meter cavern in the Rose Chamber of the experience. The 8-minute cinematic ends to reveal Europe’s oldest wooden staircase, restored and documented over a ten-year period by Vienna’s Natural History Museum. The Bronze Age Cinema seats up to 70 visitors for each performance and at the end of the presentation they can view prehistoric artifacts in custom made cases using LED lighting. “During installation, these were flown in by helicopter to the tunnel entrance and through narrow passageways with considerable skill,” enthuses Tobias Stumpfl, CEO at AV Stumpfl. AV Stumpfl FHD Players drive content to three Canon XEED WUX400ST short throw projectors that are edge blended. The projectors are installed at a distance of 2.5-metres in front of the Magnum motorized screen to eliminate projected light onto the visitors. The motorised screen then reveals the staircase and a 2-minute holographic projection show using a fourth projector onto the rock wall creating a three-dimensional effect. This tells the story of Uldo and Erie, Bronze Age children, showing how salt was mined and transported using the stairs. The natural surfaces of the mine add visual interest to the film. The soft salt rock and surrounding limestone causes a shift of several centimeters each year. All projectors are installed on a truss traverse and changes are compensated using adjusting screws and screens re-stretched. Ensuring preservation for future generations, the ancient staircase sits behind a large transparent screen. Due to the preservation, extremely tight space and climatic conditions that the salt mine presents, Scenomedia worked with the Fraunhofer Institute, Munich to specially develop the see-through transparent protective screen materials. These were also certified by the German Technical Inspection Association. In creating the content, Andreas Scheucher, Founder and Managing Director at Scenomedia says: “Using RED EPIC Dragon cameras, we recorded footage in 6K resolution (6,144 x 3,072 pixels).” Video content is managed using the AV Stumpfl Wings Vioso toolkit with its timeline-based workflow. Show control of DMX, Artnet, triggers and lighting and sound effects is achieved using the AV Stumpfl modular Avio show control system. All components of the control network are visually connected or ‘wired’ using the AV Stumpfl Avio Manager 2D interface. AV Stumpfl IOBox media control modules store timeline and device control data on SD cards and operate independently. Content is reproduced for each projector using AV Stumpfl solid-state FHD Players. The FHD Players and IOBox are powered by Power over Ethernet (PoE). Scenomedia designed lighting and audio using a Bose sound system.